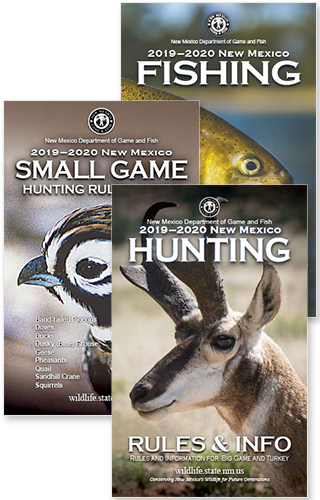 Click the tab headings below to learn more about New Mexico state laws including: illegal acts, fines, and shooting hours, as referenced by the 2018-19 NM Hunting Rules & Info. See also Big Game Rules. Recklessly or carelessly handle a firearm. Hunt while under the influence of alcohol or other intoxicants, including medical marijuana. Litter and/or pollute streams, lakes and other waters. Leave a fire unattended or to improperly handle fire. Hunt protected species without a license and all applicable permits, tags, stamps or validations, or fail to tag any big game or turkey. Hunt protected species using licenses, tags, permits, stamps or validations belonging to another individual or take or attempt to take a protected species for another person, except as permitted when assisting a licensed mobility-impaired hunter (pages 15–16). Kill more than one of the following: elk, pronghorn, Barbary sheep, bighorn sheep, ibex, javelina, oryx, bear or deer during any license year, except as permitted by rule. Apply for, buy or use more than one license for any species per license year. Shine spotlights or other artificial lights into areas where big-game species or livestock may be present, while in possession of any sporting arm, except as permitted by rule for raccoon (page 127). Take or attempt to take game species by the aid of baiting. An area is considered to be baited for 10 days after the removal of the bait. It is also unlawful to take bear by the aid of scent. Use live protected species as decoys to take or attempt to take game species. Use electronically or mechanically recorded calling devices, except as permitted for protected furbearers, cougars, bears, javelina and nongame species. Use tracer ammunition, full-metal jacketed bullets or fully automatic weapons. Park any motor vehicle or camp within 300 yards of any man-made water hole, water well or watering tank used by wildlife or domestic stock, without the prior consent of the private landowner, private-land lessee, public-land lessee or public-land management agency. Shoot at protected species or artificial wildlife from a motor vehicle. Shoot at game on, from or across any paved, graded or maintained public road or within the fenced right-of-way of any paved, graded or maintained public road. Shoot at, pursue, harass, harry, drive or rally any protected species by any means except while legally hunting. Use motor-driven vehicles on roads closed under the Habitat Protection Act or other federal regulation. Hunt or shoot at any animal from an aircraft or drone or cause any non-domesticated animal to move from its place of rest or change its direction of travel. Hunt from, signal locations of protected species to hunters from or harass game with aircraft; hunt protected species observed from aircraft within 48 hours of observation; or hunt protected species the same day of air travel, except by commercial airline or direct flight to a landing strip. Discharge a firearm within 150 yards of a dwelling or building (not including abandoned or vacated buildings on public land) without the permission of the owner or lessee. Take any animal that is protected by law but not listed as a game species and/or any animal that is listed as an endangered or threatened species. During the seasons established for any protected species, it is unlawful to drive or ride in a motor vehicle which is driven off an established road on public land or on a closed road on public land when the vehicle bears a licensed hunter, angler or trapper. During the seasons established for any protected species, it is unlawful to drive or ride in a motor vehicle which is driven off an established road on private land, without written permission from the landowner, when the vehicle bears a licensed hunter, angler or trapper. It is unlawful to drive or ride in a motor vehicle which is being driven off an established road or on a closed road when gathering or searching for shed antlers on public land. EXCEPTION: Snowmobiles may be driven off established roads, and lawfully taken game may be retrieved in areas not closed to vehicular traffic. Public land as used in this section shall mean any federally owned or managed property, any state owned or managed property, any private property which is part of a unitization hunting agreement, ranch wide agreement or unit wide agreement for the species being hunted, any private property which the department has paid for public access for the species being hunted or any New Mexico state game commission owned or managed property. A two-track road which shows use prior to hunting seasons for other purposes such as recreation, mining, logging, and ranching and which shows no evidence of ever being closed to vehicular traffic by such means as berms, ripping, scarification, reseeding, fencing, gates, barricades or posted closures. New Mexico Law (Chapter 17-2-7.1, NMSA 1978) prohibits interference with another who is lawfully hunting, trapping or fishing in an area where those activities are permitted. The first offense is a petty misdemeanor, the second a misdemeanor. If a person committing interference possesses a license, certificate or permit issued to him/her by the New Mexico State Game Commission, the license, certificate or permit will be subject to revocation. Intentionally locating one’s person where human presence may affect the behavior of a game animal, bird or fish, where human presence may interfere with the taking or killing of a game animal, bird or fish, and/or where human presence may interfere with another who is lawfully hunting, trapping or fishing. Intentionally creating a visual, auditory, olfactory or physical stimulus to affect the behavior of a game animal, bird or fish and interfere with another who is lawfully hunting, fishing or trapping. Intentionally altering, removing or affecting the placement or condition of personal property used for taking a game animal, bird or fish. If you witness any violation, please document the vehicle description, license plate number or aircraft tail number and contact Operation Game Thief: 1-800-432-4263. Anyone who takes a Barbary sheep, bighorn sheep, deer, elk, ibex, oryx, pronghorn or turkey must transport from the field the edible portions for human consumption. The edible portions of game animals include all four quarters, backstraps, tenderloins and the neck meat. Hunters are not required to remove the rib cage or organs of game mammals from the field. The edible portions of turkey include the breast, legs and thigh meat. Anyone who wounds or may have wounded any big-game species must go to the place where the animal sustained the wound or may have sustained the wound and make a reasonable attempt to track and kill the animal. This requirement does not authorize trespass on private land. Call 1-800-432-4263 for assistance recovering a wounded animal which enters private land. Anyone who takes or kills a bighorn sheep, ibex, oryx, Barbary sheep, elk, deer or pronghorn antelope outside of the legal season or without a valid license, which taking or killing results in waste of the animal, is guilty of a 4th-degree felony. Waste of the animal consists of removing from the animal only the head, antlers or horns or abandoning any of the four quarters, backstraps or tenderloins of the carcass. A violation of the provisions of this paragraph is intended to be separate from and cumulative to any other violation of Chapter 17 NMSA 1978. Points are assessed against privileges based on the type of violation committed. This includes providing false information when harvest reporting. Any person accumulating 20 points or more within any consecutive three-year period shall be considered for revocation of the following: all hunting, fishing and trapping license privileges; any guiding and outfitting registration; landowner authorizations; and/or any permit or certificate issued under Chapter 17, NMSA 1978 and its implementing rules. Defendants may request to be heard by an outside hearing officer. Recommendations for revocation are made to the New Mexico State Game Commission, which has final authority to revoke privileges. New Mexico is a member of the Interstate Wildlife Violator Compact (IWVC) and may recognize the suspension or revocation of license privileges of any person listed as a wildlife violator by another participating state. New Mexico will notify IWVC of all revocations, and other states may reciprocate N.M. revocations.Contact NMDGF Field Operations for specific information at: (505) 476-8065. Transporting illegally taken game across state lines is a violation of the federal Lacey Act, and may be classified as a felony. The Parental Responsibility Act requires the New Mexico State Game Commission to suspend the recreational and professional licenses of anyone who does not comply with court-ordered child support obligations. The purpose is to discourage parental neglect of children by suspending hunting and fishing privileges until failure to pay court-ordered child support has been corrected and a $25 reinstatement fee has been paid. For more information, please contact NMDGF Field Operations: (505) 476-8065. Sporting arms may be seized and forfeited if used to take, attempt to take, illegally possess or transport big game during a closed season; if used while exceeding the bag limit for big game during an open season; or if used to take or attempt to take big game with the use of a spotlight or artificial light. Vehicles used by anyone charged with spotlighting or hunting with the aid of artificial light may be confiscated at the scene and are subject to forfeiture and sale upon conviction. First offense: Up to $1,000 in fines and one year in jail. Second offense: Up to $4,000 in fines and one year in jail. Third offense: Up to $6,000 in fines, mandatory 90 days in jail and up to one year in jail. Felony waste of game: Up to $5,000 in fines and 18 months in prison. Higher dollar amounts may be sought in certain cases. Felony waste of game: Up to $5,000 in fines and 18 months in prison. Convicted felons cannot possess a firearm, may not vote and are ineligible to become outfitters or guides. of archery equipment only. Per New Mexico statute 30-7-16 NMSA 1978, firearm includes any handgun, rifle, muzzleloader or shotgun. Legal shooting hours for big game, furbearers and turkey are from 1/2 hour before sunrise to 1/2 hour after sunset, unless otherwise noted. Add one minute for each 12 miles west of Albuquerque. Subtract one minute for each 12 miles east of Albuquerque. Mountain Standard Time (MST) changes to Mountain Daylight Time (MDT) beginning Sunday, March 10, 2019 at 2 a.m. and ending Sunday, Nov. 4, 2019 at 2 a.m.